HCM City (VNA) – A project to apply the principles of empowering women at workplace has drawn the participation of 23 enterprises nationwide since it was launched in early 2014. 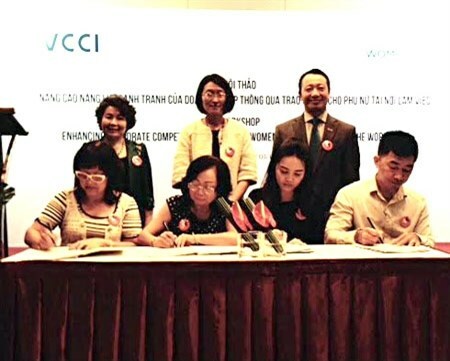 Participating enterprises included 11 from the north and the rest from the south and the project has been jointly carried out by the UN Women and the Vietnam Women Entrepreneurs Council (VWEC), as heard at a workshop in Ho Chi Minh City on November 3. Nguyen Thi Tuyet Minh, VWEC Chairwoman, stressed that gender inequality is one of the obstacles that hinder the sustainable development of businesses. Work regulations designed for female labourers, such as maternal leave, are well observed by almost all enterprises, she said. However, awareness of women’s rights to be part of the leadership as well as to enjoy fair treatment thorough the production chain remains poor, she added. Shoko Ishikawa, UN Women Country Representative in Vietnam, said that in the context of international economic integration, a business brand is evaluated not only basing on its pure economic and financial factors, but also on how it protected the environment and implemented social responsibility and gender equality. Businesses, who wish to set a firm foothold in the US and EU markets, need to comply with local strict regulations on labour safety, social responsibility, and gender equality, said Nguyen Quang Vinh, Secretary General of the Vietnam Business Council of Sustainable Development (VBCSD).